Yom Kippur Kol Nidre 2018/5779 Sermon: Which way does the Jewish clock turn? Tick, tick, tick. 24 hours until we can eat or drink again. 24 hours on the clock until the final verdict is rendered in the heavenly courts. We have 24 hours left to make a difference, to seek atonement for past mistakes paving the way for a bright future. If Yom Kippur is about our final chance to seek forgiveness before the verdict for the coming year is rendered, we sure begin this holy day in a peculiar way, with Kol Nidrei. Kol Nidrei is a legal formula about nullifying oaths, which is why the cantor is generally flanked by two members of the community holding Torah scrolls, making it a rabbinic tribunal. We know that keeping one’s vows is a very central, very important Jewish value, so much so that the Bible tells the horrific story of one of our judges, Yiftaḥ, who mistakenly felt the need to keep his vow even at the expense of his beloved daughter’s life (Judges chapters 11-12). Though it clearly should not have been carried out in that case, fulfilling vows is normally of utmost importance. “We are only as good as our word.” We can understand that we wouldn’t want to begin this day of atonement with unfulfilled vows hanging over us, so we want to begin with a legal formula cancelling neglected vows of the past. But this is not what Kol Nidrei is actually supposed to accomplish. A quick reading of the Kol Nidrei text shows that it doesn’t actually speak of forgotten vows made during the past year. Rather, it speaks about future vows, vows that we are likely to make and forget about in the coming year, but have not yet made. We cancel them preemptively! Which is very strange. We can’t be judged today for sins we haven’t yet committed. We remember this from Rosh Hashanah when we read about Abraham’s older son Yishmaʿel: God told Hagar that Yishmaʿel could only be judged in accordance with his legal standing at the time, despite God knowing that in the future he would commit horrendous acts (Gen. 21:17). Yet Kol Nidrei is only focused on the future. Which makes me think that in Judaism, the delineating line between past and future may not be as clear as we think, leading me to ask the question: Which way does the Jewish clock turn? And it leads me to tell you a story about my paternal grandfather, Harry. Grandpa Harry liked to go to garage sales and find all kinds of “metziyes” – wonderful, cheap treasures that nobody ever needed. One day he brought home an electric wall clock. When he plugged the clock in he saw that the clock ran backwards. The hands moved counter-clockwise. My Grandpa Harry was a handyman; I fondly remember liking to go into his workshop in his basement in Winnipeg and seeing him working on various projects. So when he brought home a clock which ran backwards, he immediately set about to do the obvious thing: to fix it himself. And this he did in a most simple way. First, he removed all the numbers from the clock’s face. Then, in place of those numbers, he affixed Hebrew letters, starting from Alef, running counter-clockwise around the clock’s face. Since Hebrew is read from Right to Left, it follows that a clock with Hebrew letters would need to run right-to-left, counter-clockwise. He put the clock back up on the wall. Grandpa Harry had fixed it. Grandpa Harry died seven years ago, and my grandmother has lived in the Jewish nursing home in Winnipeg for many years. I recently asked my aunt if someone still had that Jewish clock my grandfather had made. When it couldn’t be found, I decided to recreate it myself. Thanks to the all-knowing Internet, I learned that it was fairly simple to tamper with a clock mechanism to reverse the direction of the clock’s hands. The result, as you can see, is rather jarring. In Israel today, you might find watches and clocks with Hebrew letters in the place of numbers; these will be arranged in a normal, clockwise direction. But Jewish tradition does actually have backwards clocks like this. 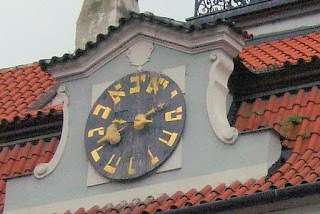 You can still go and see the clock on the side of the Town Hall in the old Jewish Ghetto of Prague, which was made just like this in 1755. Hebrew letters counter-clockwise on the face of the clock, and the clock goes ‘tock-tick’ instead of ‘tick-tock’. To be true, Jewish time does run backwards, but not in the sense of the direction the hands turn on the clock face. In the ancient world many civilizations, Jewish civilization included, saw themselves as moving backwards into the future while facing the past. There are works of Ancient Greek literature which can only be explained in this way: ‘behind me’ is the future, ‘ahead of me’ is the past. There are stories in the Talmud that use this terminological convention too (see for example, B. Menaḥot 29b). Even stopping to think about the words we use in Hebrew for ‘before’ and ‘after’ indicate that a person stands on a timeline with their back pointed to the future. The Hebrew word ‘lifnei’ – ‘before’ – contains the word ‘pnei’, ‘panim’, face. ‘Lifnei’ literally means ‘to the face’. The word ‘aḥarei’, meaning ‘after’, is also the word used for ‘behind’. ‘Hu omed aḥarai’ means ‘he is standing behind me’. ‘Hu yavo aḥarai’ – ‘he will arrive after me’. It actually does somewhat work in English too if you stop to think about it. So we actually stand with our backs pointed to the future. And it makes sense. We know everything that happened before us. We can look at it, examine it, think about it, learn from it. It’s right before our eyes. But nobody knows what tomorrow will bring, it’s hidden, like something behind our backs which we cannot see. We move into the future blindly like someone stepping backwards. And then, once a year, Yom Kippur comes and teaches us how we can step ‘backwards’ into the future without being completely blind to it. We need look to the past with our thoughts on the future. From a repentance point of view, we shouldn’t be overly obsessed with events in the past, but rather use knowledge of the past to improve our characters so that we won’t be prone to making similar mistakes again. As we know, if we don’t learn from history we are destined to repeat it. Yom Kippur can be that vital rear-view mirror that allows us to back up safely. This is very true on an individual level, regarding self-improvement. 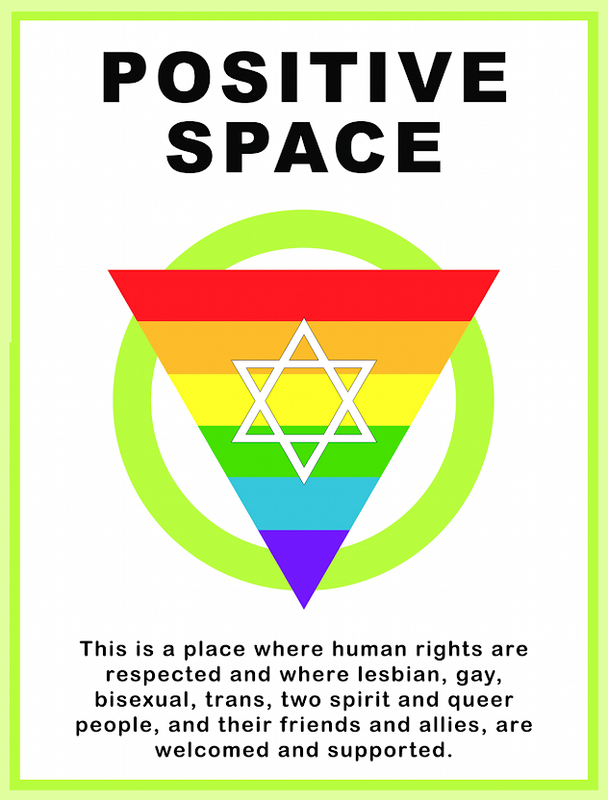 But it is equally valid for whole communities in general, and Jewish communities in particular. Communities constantly need to be doingTeshuva in a group way as well. And it needs to be done in the same way: by looking at and learning from the past, and using the past to lead us into the future, well-prepared. I would like to encourage us all to make good use of tonight, the beginning of Yom Kippur. For those of us who grew up going to High Holiday services, it feels like we’ve stepped into a time machine. We’re back in shul with our parents and grand-parents listening to the familiar melodies. Yet today is not just about the pleasant nostalgia associated with dipping into the past. We’re doing it for a reason, to learn about the future. There’s so much about us today that we couldn’t have guessed would be true when we were young. There’s so much coming in the future that we have no clue is going to come. But our tradition is rich. It’s sustained our people for thousands of years, and will continue to do so for thousands more. Judaism may be drastically different in the future, but it can survive and still be Judaism because it has trustworthy custodians: us. Cherish your tradition. “Let these words, which I am commanding you today, be on your heart. Teach them to your children and speak of them often, while you sit at home or walk on the road, when you lie down and when you rise up” (First paragraph of the Shema, Deut 6:6-7). First, education, including Jewish education must always be paramount. It always has been. Our intellectualism is our greatest strength. We need to know about our history, our people, our heritage, our land, our God, and our Torah. We need to understand to the best of our ability, to be able to make informed decisions. Second, our focus must not be on ourselves, but primarily on our children. Just as our ancestors planted trees for us to enjoy, we plant the trees which will only bloom long after we’re gone, giving their fruit to our descendants. We must be willing to put ourselves second for the sake of future generations. These are the secrets of Jewish continuity. Jewish continuity depends on each and every one of us. Let us now reconsider Kol Nidrei. We cannot seek forgiveness for mistakes of the future; we can only strive to prevent them from happening. But let us think about it positively as well. We deserve to feel good about ourselves when we take the necessary steps to ensure a good, vital Jewish future for the generations to come. And in doing so, we link ourselves to past and future and blesses ourselves with eternity. It is told that a certain travelling rabbi once checked into an inn for the night. In the morning, he asked the inn keeper about the wondrous clock hanging on the wall of his room. The inn keeper claimed it was an ordinary clock, but the rabbi insisted it was very special, and asked him to investigate where it originated. We can all reconfigure our clocks and make them chime a good tone like the Seer’s clock. You won’t find those instructions on the Internet, but you’ll here them if you frequently come to shul! Good things are in store for us and our people. Moving ahead with eyes wide open, no matter which direction we’re facing, let us eagerly await that which is to come. G’mar Ḥatimah Tovah.